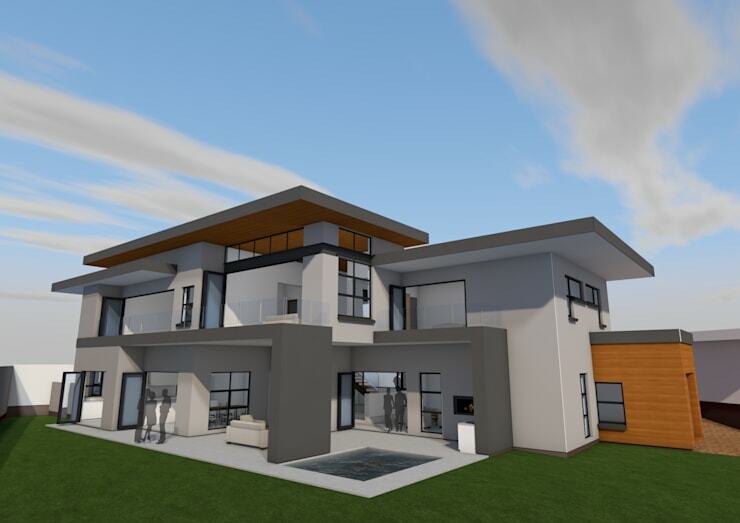 For our latest homify 360° discovery, we sneak a peek at the 3D renderings of a new subdivision development show house in Bryanston, Johannesburg, by the architectural firm Seven Stars Developments. 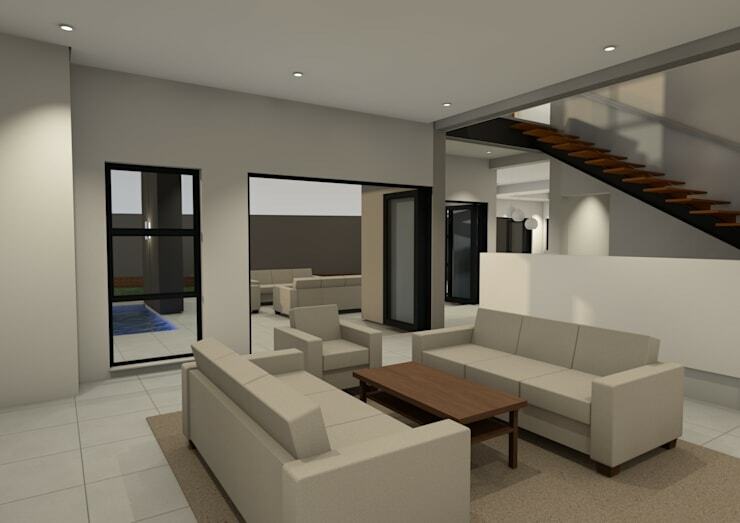 The great thing about these renderings is that they don’t detail the relevant materials or textures, meaning it’s all about space and layout – which are, of course, crucial factors when it comes to deciding if a house is perfect for your and your family’s lifestyle or not, particularly if you’re big on entertaining. A flat roof; strong linear designs; no excessive embellishments or decorations – yup, sounds like the modern design style! 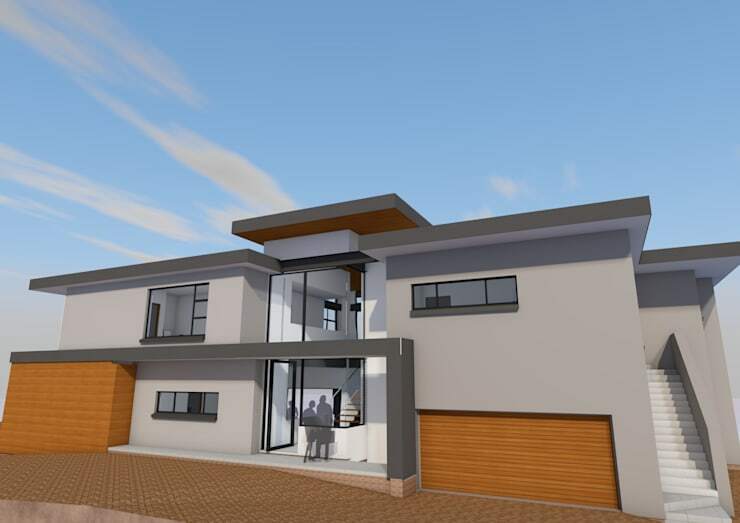 And even though this rendering doesn’t necessarily portray what the finished structure will look like in terms of material and tones, we must say that the neutral/earthy colour scheme really works, as does the wooden-clad touches of the garage doors and left-side protrusion. Much more open and welcoming at the back – after all, this is meant to be the socialising and entertaining space, and we have a feeling that this layout and look will be just perfect for that. Just look at the stylishly shaded terrace with exterior furniture; the appealing little splash pool; the generous size of the yard; the various glass doors and windows that open up onto the exterior space – the perfect spot for a bunch of guests to be mingling and enjoying themselves! 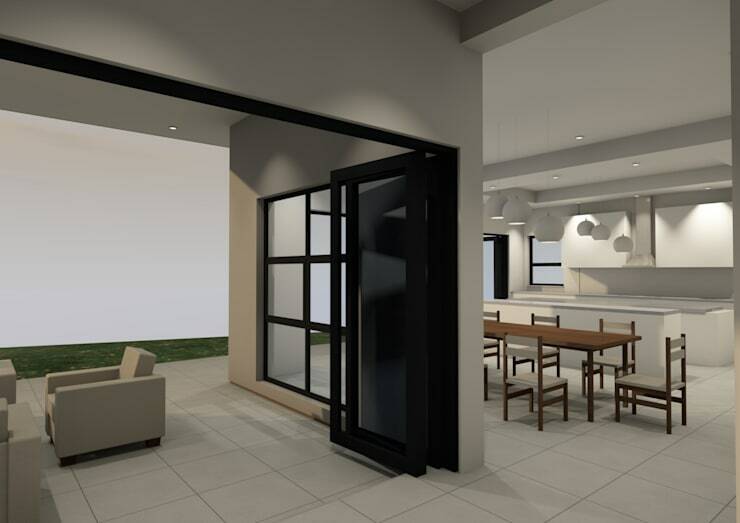 Bi-fold glass doors easily zig-zag out of the way to make the exterior areas and interior spaces come together, particularly this living room which opens up onto the terrace. An open-riser staircase adds a nice design touch to the background, and also helps to clear up more legroom than a closed-riser would have. Just around the corner from the living room we locate the dining room and kitchen, which also open up most comfortably onto the exterior terrace. It is layouts such as these that go a long way in enhancing a social ambience, making hosting a get-together (either for small or big crowds) so much easier! Speaking of socialising, let’s see how to go about Hosting a housewarming party to remember.